At last weeks Flamingo Club, a couple stood up to make a presentation. Marti and Richard Hafen were long time downtown residents, and had come back to their old neighborhood to attend the party. 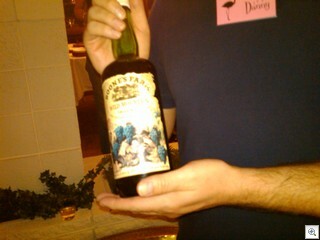 Short version, In 1973, they found a bottle of Boones Farm buried in the planter box. It had to have been there for at about 15 years, from before they owned the property. They kept it, and have now given it to the new owners of the house, J and Danny. The pictures were taken with my camera phone, so they’re probably the worst photos I’ve ever taken, but here they are. 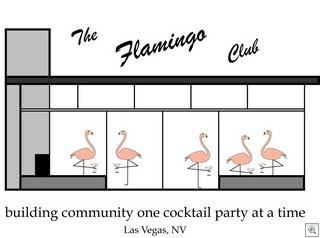 Here’s the full text of the little speech (and the long version of the story) that was given by the Hafen’s at the Flamingo Club Cocktail Party when the prized archaeological find was returned to its original home. 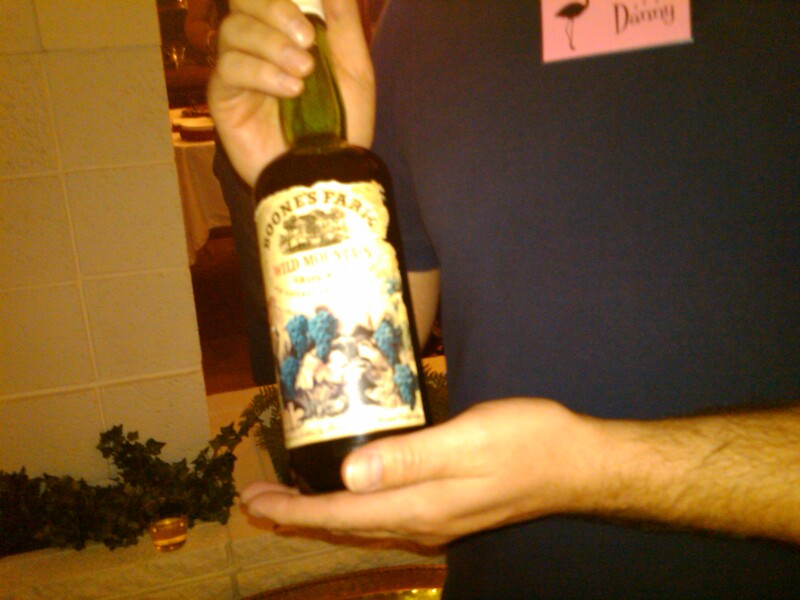 This Vintage bottle was excavated from and archaeological dig in the fall of 1973. The site of the dig was the planter bed under the living room window at the residence commonly described as 555 Ellen Way (Beverly Green Neighborhood). 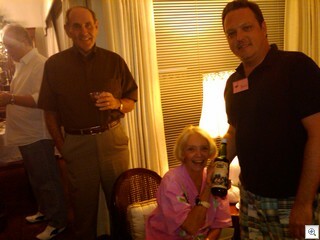 The ten residents, Richard and Marti Hafen, assumed custody of the bottle: using it as a decorator accessory in their kitchen and maintaining its contents intact. 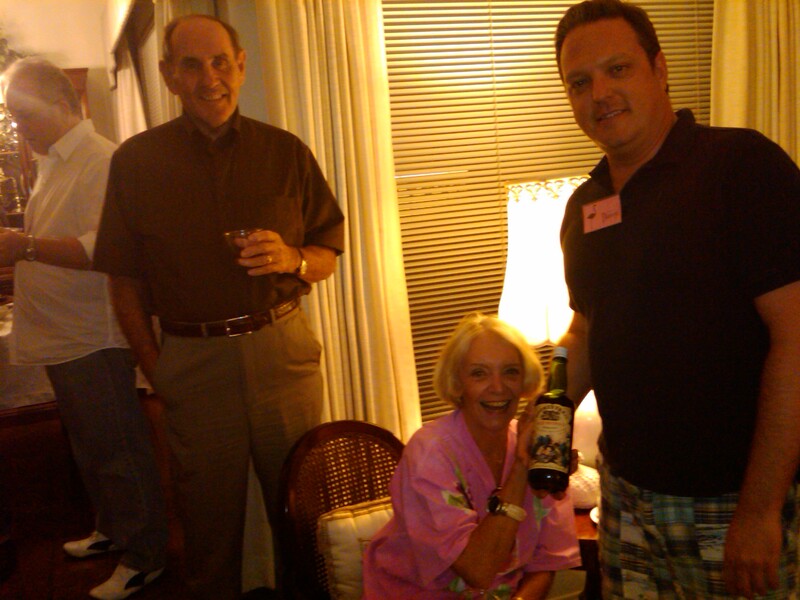 In 1994, the Hafens purchased a new residence while keeping ownership of Ellen Way. The bottle was carefully transported to their new home. They continued, for the next 15 years, to maintain it in a pristine condition – again using it as a decorator accessory in their new kitchen. 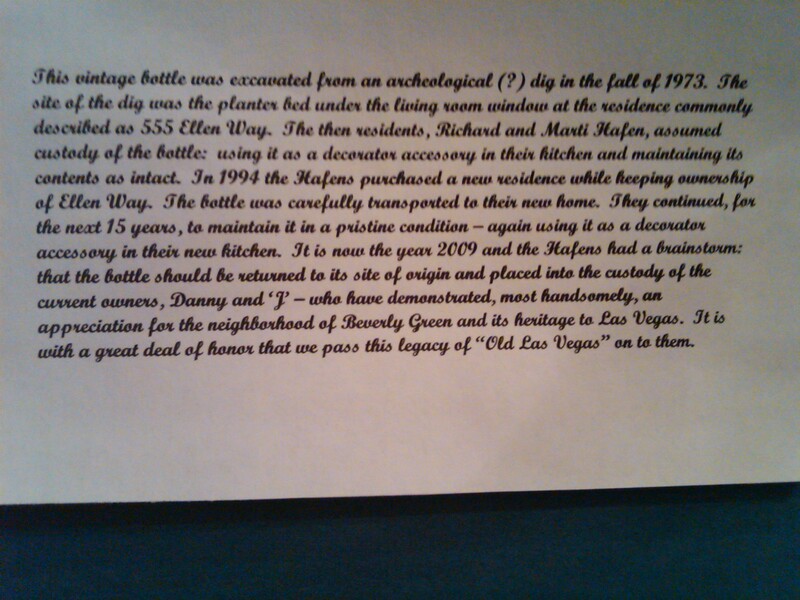 It is now the year 2008 and Hafens had a brainstorm: that the bottle should be returned to its site of origin and placed into the custody of the current owners, Danny and J – who have demonstrated most handsomely, an appreciation for the neighborhood of Beverly Green, and it’s heritage to Las Vegas It is with a great deal of honor that we pass this legacy of “Old Las Vegas” on them. 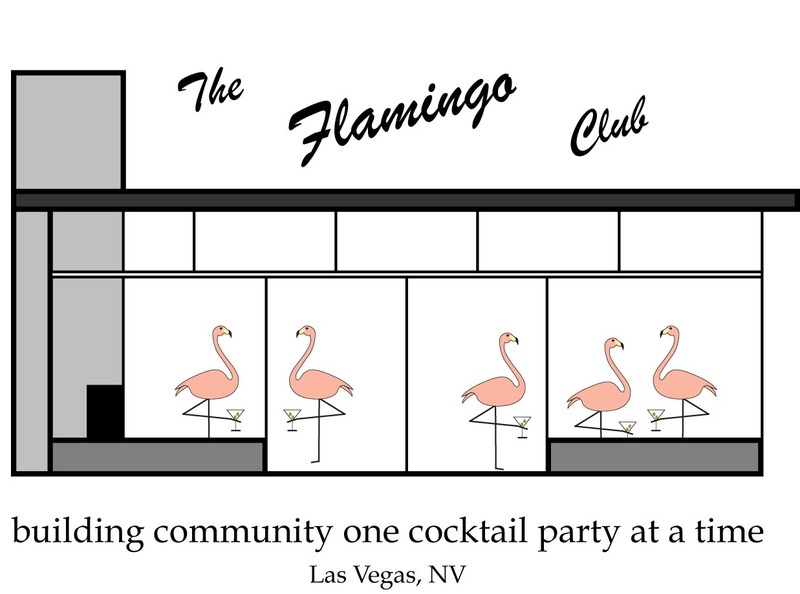 The Flamingo Club is a monthly cocktail party for downtown residents. Each month it’s held at a different home. Their motto is “Building Community One Cocktail Party At A Time”. They even have a logo, and have made T-shirts. Since the invite list is pretty well filled up (you can only handle so many people in home at one time), I believe there should be a similar sort of monthly event in all of the Historic Neighborhoods of Las Vegas. Some one in each neighborhood will have to pick up the ball and run with it. How about it McNeil, Paradise Palms, Westleigh, Paradise Crest, and all the rest? PS: take a good look at the logo. Besides the fact that the home is a classic “desert modern”, it cracks me up everytime I look at. I hope you’ll get a kick out of it as well!